What’s The One Thing You Can’t Simplify? One of the most frustrating things about living a simple, deliberate life is finding a way to accept the things that can’t be simplified. Is there something — or perhaps several things — in your life that it just doesn’t seem possible to simplify? For me, it’s my housing situation. I told you last week about my failed attempt to simplify my transportation that ended in me running into an unfortunate array of ridiculousness. But my current car is far from a gas-guzzler and is in nice condition. It’s uncomplicated and dependable. Plus, I’ll eventually find the right way to simplify that situation — once I can face another car dealer. But we’re 10 years into a 30 year mortgage on a simple house that I don’t love. It’s 1200 square feet and nicely accommodates two humans and four cats. It’s far from extravagant. It sits on an acre of land, however, and that’s too much. It’s located almost 30 miles from the neighborhood I consider home and about 15 miles from a Walmart, a decent restaurant, a bank or a park. Living closer to the things that are important to us would also reduce our dependence on a car, essentially solving the need for a more fuel efficient one too. Because we owe more on the house than it’s currently worth, we’re unlikely to be able to sell it. There are also several unoccupied homes in the neighborhood, further reducing our chances of selling. My dream is to have a nice apartment in West Fort Worth. We’ll never find one for the same amount we’re paying on our small mortgage, though, and even if we could find a place that allows cats, it isn’t legal to have four cats in one household in most of the cities around here. The neighborhoods in which I’d most like to live are far beyond my current financial reach. I’m less than satisfied with my housing situation, but my perfect, dream accommodation isn’t realistic either. In essence, I can’t simplify my housing situation. I’m grateful that I have a safe, affordable and comfortable home, but when I dream big, I dream of a smaller, simpler lifestyle. What part of your life frustrates you because you can’t yet improve it? What part of your life seems to have a wall around it, separating it from your best efforts at minimizing? I have a great life, and many of my efforts to cast off complexities have improved my life. My income is still lower than I’d like (something I’ve written about before), and my home isn’t ideal. Just about everything else about my simple, deliberate life is magnificent. I’m a lucky guy, really, who is reaping rewards of good decisions every moment of every day. But this house thing really bothers me sometimes. There’s always something, isn’t there? 1. If you aren’t living in a McMansion, it isn’t so bad. As for the mortgage being underwater, inflation will change that for you. Inflation erodes savings, but it also makes debt easier to pay down. In time, your housing payment will look dreamy compared to rent. 2. Cats are cool. I miss my cat. Thanks for joining the conversation, Charlie. And thanks for the encouragement. You’re right, of course. And if we do decide to try to sell, some recent improvements in other properties in the neighborhood should bring up our property values. I’m reasonably happy with my current housing situation – we currently have an apartment that’s on the order of 600 square feet. Other than the layout of the interior walls, it’s a pretty nice space. But I wish it had more of an open floor plan – a sectioned-off bedroom and bathroom would be okay, but I wish the kitchen was more open. It would facilitate a lot more “living” in the space. If we moved we’d probably be looking for a place with a more open floor plan of some sort. Not a lot of room for grumbling though as the rent is very affordable and we only live a block away from where my wife works. It’s interesting because our kitchen and living room are open, and I’d like something more closed in and with lower ceilings to make air conditioning more efficient, a major concern here in Texas. I would think 600 square feet is rather small, but I can see how it would be plenty. We could easily manage with that. My mother has about 750 square feet in her apartment and it’s very comfortable. Just think of it as a temporary inconvenience and if you can’t change it right now, try not to stress, the time will come when you can get to the area you want to be in. Easier said than done though! Is it really not legal to have four cats in apartments over where you live? Even if you own the apartment? Guess I’ll have to stay on this side of the pond with my 5 dogs! Been enjoying your blog for a while, thought I’d add to it this time. Cities can make ordinances regulating the number of pets in a household and many do. No one enforces this unless there is a problem with an animal biting someone or if you’re accused of animal abuse, but you could certainly not have more than the legal limit in a rented apartment. Thanks for commenting. It’s nice to have you here. Would love to simplify the way others have control over my life in the form of rules and regulations allegedly put there to make my life more simple. I think it is just a simple matter of going to a government department to fill in a form so that I can get a permit. First I am told it is out of office hours but when I arrive in the stipulated time frame then nobody is there. Finally get the forms filled in and go to pay but the system is offline. A simple life complicated by incompetence and apathy. Permits are notoriously hard to actually aquire around here too. Governments are run by people whe enjoy rules — otherwise they wouldn’t be there. 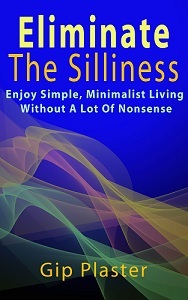 I’m a minimalist in that respect also: I think we should have as few rules as possible. Governments seem to want a rule for everything. Here in Texas, the legislature is considering a law to make sure that cities don’t neglect enforcing immigration laws even though no city has suggested that it is considering doing that. We always have an endless supply of wants, even if those wants are wanting something smaller, more efficient, different. It seems that the major problem with your house is not those issues you mentioned. Higher ceilings and 15 miles from a WalMart and your old neighborhood are really trivial issues when laid out like that. It seems the underlying issue is that you don’t like your house anymore, but because of today’s housing market and the economy, you have no prudent way out of living there. There are a lot of unrecoverable costs associated with selling a property and moving. It will take a heck of a lot of trips to the Walmart (and if you are living simply, how often do you need to go to WalMart in the first place? ), and a lot of driving a few extra miles to a restaurant, and a lot of slightly higher air conditioning costs to simply break even on those moving costs before you even begin to see a bottom-line difference in your finances. You apparently have an affordable mortgage, and some space around you, which is not a trivial thing in many ways. Don’t want to maintain that acre? Plant it in wildflowers and just let it grow. From the height of my advanced years (late sixties), my advice to you is to love what is until circumstances change. And circumstances always change. Nothing lasts forever, not even the good times. You’re right. The problem is that I don’t really like my house, and sometimes I do like it. It’s actually that I don’t like the fact that I’m stuck with it. In any case, you’re right about all the unrecoverable costs being much more than the costs I have now. Every home and location has disavantages. I keep reminding myself that I’m glad I don’t live in Houston, where my 30 mile drive to where I enjoy spending time would be all in town and could take 2 hours. When we Texans don’t like something, we tend to remind ourselves how nice it is that we aren’t in Houston! Thanks for commenting, Marti. I’m glad you’re here. I’m in a similar boat to you, Gip, in that where I live right now is 30 miles from anything. I enjoy being away from the crime and pollution of the city, and small-town life has its charm, but with fuel prices the way they are I have to mentally add an extra ten dollars and an hour or two of time to the cost of anything I do that involves a trip to town. I’ve been considering moving back to the city for economic reasons as well as time saved/wasted. As far as things I wish I could simplify but can’t, it’s all the silly and unnecessary hoops I need to jump through when dealing with bureaucracy. Most recently it has been proving my existence and state residency. Normally, they ask for something like a utility bill with your street address. Well, what few bills I have I handle online, none are for land-locked utilities (water, electric, landline phone or internet) and even if they were, there is no street delivery where I currently stay – what little mail I receive goes to my Post Office box, and they won’t take anything with a PO box address! Who knew it was so easy to disappear off the face of the earth, eh? We are in a similar situation. I have to figure in the extra costs of going to town also — and then usually do it anyway. As other posters have pointed out, living in the city has costs and problems too. And I do feel completely safe and secure here — and I’ve noticed that apartment complexes I could afford don’t seem all that safe. Maybe you should forget proving your residency and disappear. Do you know the Texas band Brave Combo? They have a song where they repeatedly yell “Do something different! Disappear!” It’s probably on YouTube. It always sounds like a good idea to me. It is our dream to build a mostly self-sustaining home that’s smaller than what we have now. We’ve actually been talking about waiting until we have enough equity in our current home to pay cash for a smaller, more self-sustaining home. I’ve never lived in a real city or suburban neighborhood, so I don’t know how I would handle that. It seems with each comment response I write, I’m liking my house better. I feel like I’m the only person in the world wanting to upscale my house but still craving a simple life 🙂 We bought a fixer-upper last year and have just started 10 months of major work on it. I can’t wait to get home (we’re renting for the time being) as renting is a pain in the backside. Everything takes longer since you can’t just fix something, it has to go through the agent and to the owner and back. So very tedious. The one thing I can’t seem to simplify in my life is taking care of my dog. She always seems to have some condition or injury which requires vet visits, or exercises, or treatment or…. I can’t, and won’t, deny her what she needs as long as I can financially and physically manage it, but it does make life complicated when she has vet visits once a week in a city 2 hours from home, and 15 mins of exercises 3 times a day, and frequent short walks instead of longer ones, and complicated food. Every time things get back to ‘normal’, something else happens and it gets complicated again! Pets are anything but simple. I wrote a post about that a few weeks ago. But they’re one of the complicated pleasures that makes a simple life worth living. One of our cats recently had a medical problem, but she’s better now. The other three need checkups soon — and one of them probably needs her teeth worked on. There’s always something, but pets are worth the investment of time and money to me. ah right now I have a debt load that I would love to simplify. Several rental houses that I am trying to sell and its sucking all my time and energy. I have to dump $7000 into one house just to get it ready for market and I don’t know If I will get the money back on the back end. I am plugging away at the debt I just wish I could get it reduced sooner. I know for minimalism to work you cannot have the amount of overhead that I do. Exactly. And that’s why it isn’t completely working for me yet either. I have way too much debt — and it isn’t getting better at the moment. But things have been going well recently, so I hope I’ve turned things around. It’s good to have you here. I appreciate you commenting again. Medical bills. Sorting and keeping track of medical bills has got to be the biggest pain in the whaddever. I can understand how much extra costs are involved in generating the paperwork I’ve got to deal with, and neither of us have cancer or something super-complicated. Family. We don’t pick our families but they sure can complicated our lives. My parents are creating a situation worthy of Shakespeare. Environment. Like you, we are stuck living where we are but the climate here plus the pollution levels are crippling our health. We’re trying desperately to make enough money to get away, but the health problems slow down our efforts. I hope this post is proving that we all have issues that complicate our lives, but we can’t let them derail our efforts. Even if you aren’t ever able to simplify those aspects of your life, they’ll be easier to deal with if everything else is simpler. Good luck in dealing with the complexities and simplifying what you can. It’s good to have you here, as always. We moved to a much bigger house as the birth of my second child loomed. I now regret it. Not due to debt, as we do not have any – but rather much of the space is unnecessary and as I now look to ‘eliminate the unnecessary’ it seems out of kilter with my being. I miss my small home. Practically however I know it would have been too small – but I went from one extreme to the other? Don’t get me wrong it’s not a McMansion (presume that’s pretty big) – they are hard to find in the UK unless you are seriously wealthy. We will move at some point but not yet – I fancy somewhere quiet with a slow pace of life and lots of trees. Ultimately the dream is to sell it all and live out of a campervan (RV) – I just hope I’m around for that adventure! ps – if you hadn’t picked up on it I’m in a bit of a morose mood! Hoping to snap out of it soon heehee! I hope you snap into a better mood soon. I’ve been recovering from some kind of mood issue in the last week or so. The best definition I could find for a McMansion is “a large modern house that is considered ostentatious and lacking in architectural integrity”. Around here, they’re often built from lot line to lot line on lots that are too small, leaving no yard — and they tower over their neighbors, making nuisances of themselves in the neighborhood. Cities didn’t ban these kinds of houses at first because they never knew they would catch on. We were shown smaller houses, and I wish we had chosen one that’s smaller and a more closed-in floorplan. Oh well. Yup we do have those here…. not sure mine would qualify, maybe? Interesting will investigate! p.s. Mood is most definitely improving, have had lot on plate – but am turning corner! onwards and upwards eh? There’s something interesting about the idea of you in a clutter-free McMansion peering out over the top of your neighbors. Gip, have you thought of closing off part of your house, if it is too big? I have a friend with a big house in the same boat as you and she is thinking about literally closing off part of it so that it won’t be heated or cleaned until further notice. That’s my sister’s idea of a joke, I suppose. She knows my mother would never go for anything so logical. I discovered my urge to move often was because I somehow believed if I lived somewhere else I would be someone else. That never worked. Now we live in a 35 foot motorhome traveling all over the US and I’m finally learning to be me. I’m afraid the urge to be someone else is part of the reason I (still) want to move from my current housing situation. It hasn’t worked for me in the past either.